Agent Mark Steinberg is refuting a GolfDigest.com story suggesting there is a three-year deal for The Match and spinoffs, telling ESPN.com’s Bob Harig that discussions will soon take place. But nothing more. This could be a negotiating ploy since his client was amazingly generous with the knee-knockers and is without question the primary attraction. But it sounds more like a traditional conservative approach by the Woods camp on high-profile deals and no rush to commit to something. A couple of months removed from The Match, the question I keep coming back to relates to the paywall issues: who will try to pay for a sequel of some form after getting it for free? That may be a question Tiger and Steinberg will be raising when discussions take place. I don’t agree that The Match between Tiger Woods and Phil Mickelson demeaned the game as Brandel Chamblee says in this GolfChannel.com opinion piece. Moments were groundbreaking and entertaining, others were embarrassing (the piles of cash, the side bets for charity, the given putts). Anyway, harsh take here from Brandel! 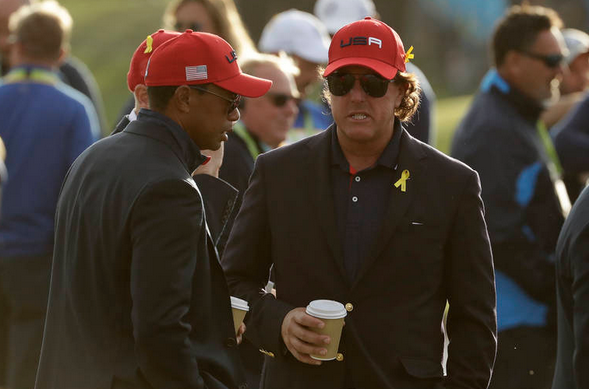 Tiger and Phil looked like two guys who needed the money and were only there for it. That’s fine, everyone watching likely has been guilty of the same, but we are not meant, in watching these events, to be reminded of our lives. When an athlete gets lost in their art and performs like they don’t need the money, the audience gets lost with them and forgets their own lives; that’s transcendent. The Match was not transcendent, it was transparent, and it demeaned the game. Period. People wanted to watch The Match! Good. The largest telecommunications company America couldn’t take your money. Not good. It involves taking a feed, ensuring it works on devices such as Xbox or Roku, encrypting it, inserting ads, then handing it off to a third party for delivery to an internet provider -- all in real time. A crash means viewers can miss a thrilling touchdown, buzzer-beater or a missed putt. But as Smith notes, the actual stream of The Match worked fine, it was the actual attempt to pay that failed, with most reporting a complete inability to get anywhere while others say they got in without ever being asked for a credit card number. The high volume part is great news for the organizers. Though the only number available at this point is an AP mention of 500 on hold waiting for assistance when the technology failed. The complete meltdown component will take time and perhaps even a new model to convince consumers to try paying. As Ryan Lavner notes in this blistering assessment of the proceedings, the price may have to come down if there is another attempt taken. Sports Business Daily offered two tough love pages of reviews (here and here). Before the business story engulfs The Match—if the across-the-board refunds haven’t already done so—let’s consider how the promises of a groundbreaking event played out. Alan Shipnuck at Golf.com says The Match was sold as a spectacle and merely delivered two guys playing golf, which was good enough for many of us to be entertained but a failure based on the marketing message. It was an exercise in cognitive dissonance. The announcers wouldn’t stop raving about Shadow Creek’s aesthetics but my eyes kept going to the aeration holes on the greens. There was breathless talk about the use of the world’s largest drone for beauty shots but its buzzing was so loud it was a distraction on nearly every shot on the opening holes. I was excited to have the players mic’d up, until Phil’s heavy mouth-breathing and Tiger’s snotty sniffles hijacked the broadcast. Dan Wetzel at Yahoo says The Match was worse than Caddyshack 2. There were a few side bets that should have been fun, but this event was so over-marketed and over-sold that it was nearly impossible to believe either was laying their own money on the line. Someone else was going to pick up the closest-to-the-pin bets. On the back nine and the playoff – yes, it went 22 holes — no one bet anything. It was like they were over budget or all the other bets were pre-planned. The Forecaddie on Turner taking the brunt of the financial losses, not the narrative they were hoping for or the one AT&T CEO Randall Stephenson had in mind when they spent $85 billion on Time Warner. Dave Shedloski at GolfDigest.com suggested the event went well, with the pay issues caused by overwhelming demand. WarnerMedia’s B/R Live platform was so inundated with subscribers who waited until the last minute to log in that it had to offer the program free for a limited time until the traffic jam subsided. “We are very encouraged by the initial subscriber numbers,” a smiling Turner President David Levy said as Mickelson and Woods made the turn. AP’s story on the streaming issues said 500 people were “on hold” at one point trying to get help paying. What that means isn’t clear. But as Darren Rovell notes, all of those Turner meetings to determine the price for The Match were one giant waste of time after the mass-refund. Jason Sobel lamented the flashing of cash and also the announce team talking over the sound. The bigger problem is that the announcing team stepped all over the stars of the show throughout the day. The whole benefit of Tiger and Phil being mic’d up is that we get to hear their conversations with each other, with their caddies and with the fans. Instead, it felt like every time they opened their mouths, one of the commentators would speak over them. Rex Hoggard on the PGA Tour helping to undermine The Match by limiting the number of side challenges, which had moments and were for charity. Too many bad cooks in this kitchen! The playoff hole took a few punches over at Golf.com where the Confidential gang saw plenty of positives too. Berhow: The drone shots for some of the putts were pretty cool. The banter disappointed (shocker), and deciding this whole thing from a putting green (with teed up golf balls!) to a green just 93 yards away seemed very anticlimactic. Although maybe that ending was strangely fitting. Kerr-Dineen: The much-hyped “trash talk” was painfully awkward and wholly underwhelming. I was a bit disappointed by the overall on-course commentary, too. It was a bit too straight-and-narrow for the event; I’d have liked to see Barkley more involved in the play-by-play. What was better than I expected? Probably the playoff. Wedging it off a green to another green with $9 million on the line? Bonkers. Dan Kilbridge on the celebrity scene just outside the ropes. That continued Saturday with a pro-am where Tiger and Phil attended. Lucky them! John Strege considered the telecast and noted that much of the great sound we heard was natural, inside-the-ropes commentary from the legends taking part. Yet even with a match coming down to the final hole and what evolved into a farcical playoff (teeing it from the putting green in the dark) with $9 million at stake, it was not especially riveting, given the mediocrity from two of the best in history and the time it took them to underperform. Finally, Dan Kilbridge on the celebrity scene just outside the ropes. That continued Saturday with a pro-am where Tiger and Phil attended after the previous night’s Topgolf after party. Talk about evidence they were both paid the same rate! More than any contribution it made to television innovation, gambling intrigue or Phil’s pocketbook, The Match reminded us that the Skins Game worked. What a perfect time for the organizers of The Match to pick up the right to bring it back with modernized elements. As The Match played out and the gambling possibilities were just too tricky to work out despite Shadow Creek’s endless walks between greens and tees, the simplicity of the Skins Game kept making so much sense. Skins died when the money became irrelevant for today’s players and you were left with oddball foursomes, including 2008’s gathering of K.J. Choi, Stephen Ames, Rocco Mediate and Phil Mickelson. It deserved to die. And while The Match was never that interesting because of the $9 million at stake for the winner, you’re only going to get top players if it’s going to pad their pocketbook in a meaningful way. More than anything, The Match reminded us that Skins was relatable, just unpredictable enough for viewers, and predictable enough for television to take a crack at showing it. At nine holes, it didn’t force us to sit around too long. Perhaps a new Skins Game needs to return as a nine-hole event and for just one day with three holes played for $500k each, $1 million for the middle stretch and $2 million each for the final three. Lift the best elements of The Match, spread the wealth to four players and use the pay-per-view concept to justify renting an exotic golf course. Oh, and make sure the credit card readers are working. Charles Barkley - He should have been on the full broadcast, in hindsight. He got right to the point as Tiger and Phil struggled horrible to read Shadow Creek’s greens. He jousted as only he can with Justin Verlander’s Tweets, too. But sadly, Barkley also was not around for the last couple of hours to put a bow. The Audio - Turns out, a feed of just open microphones would have been enough for most people. Phil was in hard sell mode early but once he settled into a normal round of golf, basically narrated the proceedings. Tiger chimed in with enough to make a player-only feed functional had that been an option. Yes, Phil was winded at times and a breather was distracting, but the real potential for this production came together as both players had driven beautifully down the 6th, the cameras were tight to both players as we could hear each in between clubs for the approach. The kind of gripping cinematic moment that the organizers had envisioned. ShotLink Putt Probables - A simple graphic told us how far the player was from the hole and his career make percentage (ShotLink era) from that distance. Simple, clean and informative. Live Drone Shot Down The First Fairway - It was pretty cool to move from one last player interview to a live shot down the first fairway. Unfortunately, the technology appeared limited from there on out. Perhaps too many competing cell signals? Pat Perez - he sounded engaged and as someone who knew the players, through in a few opinionated remarks about being surprised that Tiger was giving putts and at how they were orchestrating the charity-driven side bets. And not one F-bomb! Hole Graphics - animated hole graphics with tracer technology may have been the most vibrant and eye-catching I’ve seen. Once it was clear the drone was not reliable and the drone flyovers were needed, these jumped out as adding a futuristic feel to the telecast. Tiger Woods’ Generosity - Wow was that many giving putts! But they all helped in the interest of pace of play and entertainment value of the match. This is a nice way of saying he twice prevented (possibly) having The Match end on a missed putt. Phil returned the favor once, by my count. Announcers Talking Over Players - Everyone was guilty at some point and I’m sympathetic to the cause as this was not a normal broadcast crew, not a normal match and an unprecedented amount of sound for a sporting event to take in. Still, to miss out on Mickelson asking Russell about a rule of golf change he just does not comprehend and several other side chats about shots, was tough for the core golf fan. The more novice viewer may prefer announcer storytelling, which is why lead announcer Ernie Johnson trampled over so much talk. The Champion’s Belt - sensational buckle design, simple brown leather look but uh, it didn’t fit Phil Mickelson, who looked visibly annoyed he couldn’t put it on. Next time, let’s make two belts, one for those with subcutaneous fat and one for those without. Ernie Johnson - As Phil Mickelson is looking through his rangefinder for a yardage, Ernie Johnson is telling us on the 18th hole that Phil “has the laser out.” Somewhere Frank Chirkinian was screaming. Unfortunately, Johnson regularly spoke over on-course conversations, stated the obvious (what we saw on screen) and did not embellish the action. He would have been better served by having his Inside the NBA counterpart Charles Barkley in the booth, perhaps. Natalie Gulbis - She appeared for some first hole observations and surfaced again at the 18th tee for a bad interview after Tiger’s chip-in. Her absence in between was not missed. The Playoff Hole - a wise move by promoters to be ready for a tight match and sudden death, the 93 yard shot required a hole location change and had a strange feel to it given the amount of money at stake. Capital One Ads - Presented in Playing Through mode as we saw golfers walking off the tee, we missed out on match discussions to be annoyed by Samuel Jackson and Charles Barkley asking what’s in our wallet. Better than Capital One cafe spots, but still pretty annoying commercials given that some of us paid for the match. Gambling - All of the stakeholders learned a valuable lesson today: golf is tricky to bet on and real-time gambling is even trickier. While Mark Broadie supplied some stats that were of note. But the whirlwind nature of a two-man golf match—yes it moved amazingly fast—made it hard to embed bets or betting scenarios to enjoy. The most interesting pointed out may have been at the 7th tee when we learned the great 5-1 price punters got on the match being even after nine, was in play. Otherwise, the action moved too fast for fun gaming. Gambling 2 - We heard about what MGM punters were betting on each hole but was it interesting to hear what punters were putting on each hole, without any real reason to be better players on particular holes? Not at all. Shadow Creek - The course lived up to its name, serving up shadows while the late light hit the treetops. This created an unimpressive look to a course once ranked in Golf Digest’s top ten in the U.S. Add on the excess of Flinstone rocks, strategically-light design and tree overplanting, and Shadow Creek did not pop. 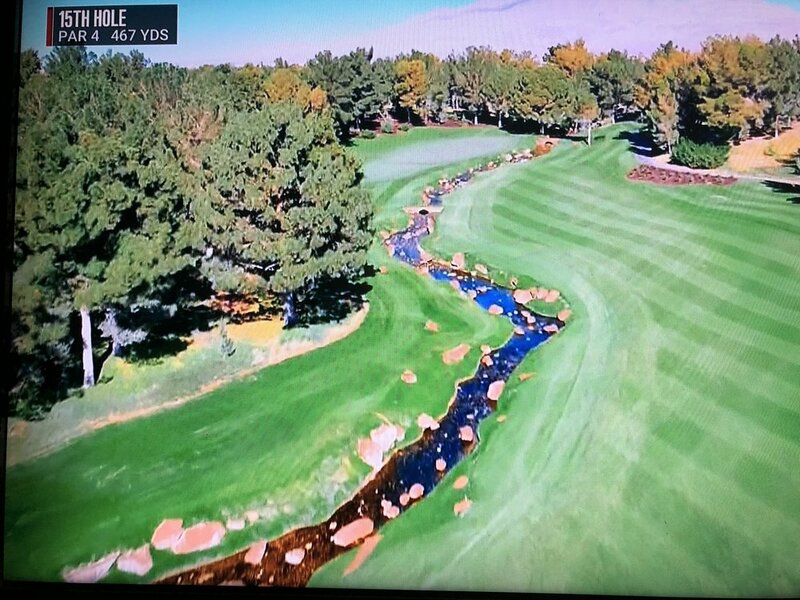 The course exuded underwhelming television appeal in part because of the odd lighting situation. The 17th hole was deemed a genuine centerpiece but came off looking like something even waterfall lover Donald Trump would say was sooooo last century. AT&T/Turner/Bleacher Report Synergy - Seen as the future of sports broadcasting, the inability to conduct normal transactions and ensuing decision to give away a pay-per-view match overshadowed everything. The disastrous rollout of the supposed future of broadcasting and sports packaging provided a stark reminder that the rush to usher in a new era is just that: rushed. Darren Rovell first broke the news on Twitter after most potential online buyers of The Match’s $19.99 stream could not even reach the point of giving BR Live and AT&T their money. His ESPN.com story explaining what caused the backers to throw in the towel and give away the stream. Anyone on Twitter heard immediate reports of viewers unable to even get a purchase going, while others mentioned getting The Match free without ever paying. Which, it turns out, was around the time executives huddled somewhere and uh, cut the pay cord. Given the number of sports organizations and media tycoons taking The Match’s pay-per-view streaming temperature, the failure could rank with the great debacles in sports television history. Then again, maybe many weren’t paying and the decision was easy. Who will be hurt most by losing paid streamers we won’t know since AT&T, Turner and its various affiliated brands were making a grand synergy play here. Did Tiger and Phil receive a cut of the paid subscriptions? We also won’t know that unless one of the parties publicly complains. Or sues. The culprit behind the technology failure is also not known, though SBJ’s Austin Karp noted Turner’s $200 million purchase of iStreamplanet as a possible source to consider. As for those who did pay—myself included—the experience via a cable pay-per-view pass was excellent until non-AT&T-owned outlets ended the stream before the trophy ceremony where Phil Mickelson was unable to get the winner’s belt around his waist. As we get ready for The Match to tee off, I’ve been most intrigued by the test run here for golf wagering. The telecast promises some Mark Brodie-influenced stats to play along with for those sitting in the sports books and to allow the rest of us to visual what real-time gambling on a match could look like with the proper tools at our disposal. While I’m reserving judgement until those elements are presented today, The Match has provided another reminder that the bookmakers still do not understand golf and how to craft compelling wagers. I’ve attached some of the prop bets below and here is Golfweek’s updated list. Unfortunately, with two players who have no public track record on the course, playing match play and with their games having been out of view since early October, the pre-match wagers have not been the kind of fun head-scratchers you’d hope for. While that is not entirely the fault of bookmakers, anyone who knows golf realizes the stupidity and lack of value being offered. Will there be a hole in one? +550? Seriously? Will Phil win the first three holes? Which player will have the most birdies? Hole by hole odds? For the chance to win $20 on a $100 bet? Even something like the first to go 2 up just doesn’t have much spark when we don’t have track records to look at. You can get way better value at the race track. Or the dog track. Some of the prop bets sent out to writers intrigue but do not appear to be offered by the promoters or the most commonly used offshore websites. So a friend tells me. Will Phil Mickelson record an official three-putt? Will Tiger Woods record an official three-putt? How many side bets will be made by Tiger and Phil? Under…that seems like a lot! Oh please, under! They aren’t sailors! Then again, are we going with Carlin’s definition or something else? Oddly, I feel he’s got four in him against Phil, on TV, feeling frisky. Will Tiger Woods wear a red shirt? Is John Daly overweight? Of course he’s wearing red. A better bet on Phil might have been long or short sleeve since +100 on black isn’t very compelling. Anyway, given the vagaries of our sport, golf will need to convince the masterminds that offering such prop bets to promote discussion and to liven up the entertain values. Trying to speculate on elements related to a course we don’t know, with no track history and played by two players who haven’t been visible for nearly two months, isn’t even interesting enough to ponder. Much less, bet. The reclusive Anthony Kim has surfaced in a video Tweeted by No Laying Up. Reportedly living off insurance money while nursing injuries and harvesting manbuns, has resurfaced. Sitting with at least five of (presumably) his dogs, sounding eerily like Luke Walton and declaring his intention to place his first-ever bet on Phil Mickelson in The Match, Kim was golf’s break-out star in 2008. The Match week is here! Calm down! 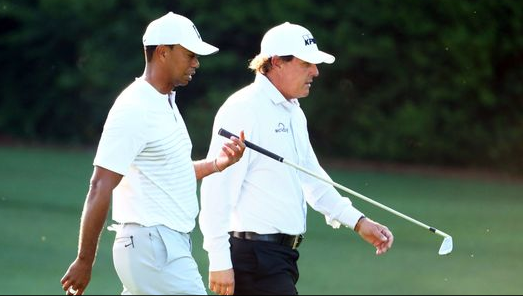 The Athletics Richard Deitsch assembled a panel of writers to discuss ramifications and interest level of the Tiger Woods vs. Phil Mickelson pay-per-view showdown this Friday. Yes, having to pay for it is annoying, but, as even Mickelson noted, that $20 can be split among friends who take in The Match together. While not suggesting how to spend other peoples' money, we are talking about a discretionary income choice that many would squander on other dubious endeavors. And it is Black Friday after all, a day associated with money-spending opulence. Christine Brennan at USA Today makes an opposing case. But in a holiday weekend overflowing with real, meaningful sports events, faux golf is out of place. Look at the trade-off you’ll be making if you watch: while either Tiger or Phil will make $9 million in the winner-take-all match, you’ll give up four hours of your life that you’ll never get back. Tiger and Phil will preview their head-to-head match play competition in Las Vegas, minus a weighing-in ceremony. The press conference will stream live on B/R Live. So with all of that presented, I’d love to hear where you stand on The Match and will you fork over the money? Here were the results from earlier this year when we were speculating on prices you would pay. Will you pay to view The Match? As a TV show it’s not a surprise they are limiting this to high rollers and other corporate drones, but it’s a bit disappointing that the “under the lights” element Phil Mickelson predicted for his pay-per-view match with Tiger Woods will be played only in daylight. Brian Hurlburt reports for the Las Vegas Journal-Review on the $9 Million (Because The PGA Tour Says So) match set for next month at Shadow Creek.